We Moved into our house October of 2012. It was a foreclosure that had sat for a year unoccupied. The story of how we found it was quite miraculous. We had moved from the Kalamazoo area in Michigan to Wausau, Wisconsin about 2 1/2 years ago into a tiny rental house. We didn't want to rush into a new house, partly because we had some pretty specific needs in our next house, and partly because we wanted to get a good deal. We must have looked at 100 houses over the two year span...but that's another story for another day. 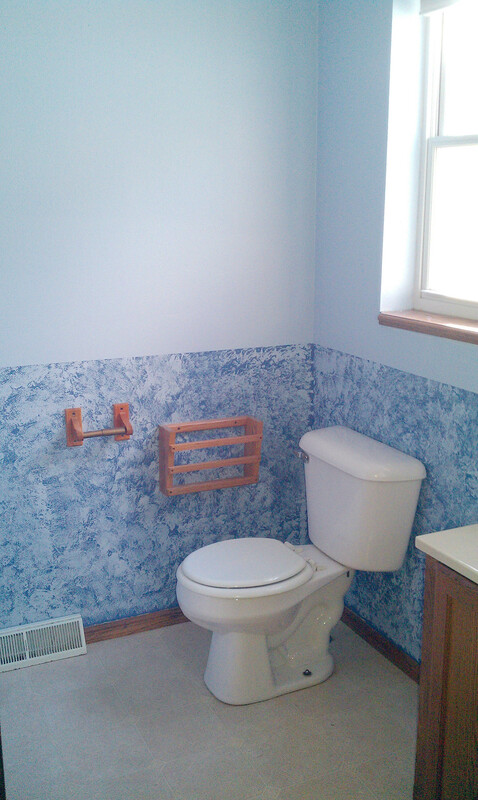 But today, I'm sharing our little half-bath redesign. It is simple - just a bit of painting made all the difference. I've had a lot of requests to show before and after pictures. Here is a "before" picture of our half bath. The whole house had been a DIY project in years past. The former owners did their own sponge painting, and the result wasn't quite my taste, though I have done some of my own sponge painting in the past. This was the first time I was brave enough to paint the walls of a room a dark color. 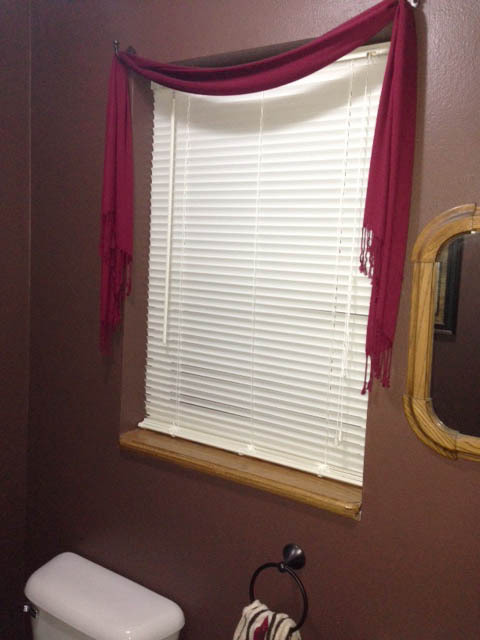 The white/dark brown contrast is great for all types of people and it's cozy - that's if a bathroom can be! The next addition will be an (aff link) ADA elongated bowl toilet. These little ones are great for kids, but visitors with bad knees (like my DH) would appreciate a highter bowl. Just wait unitil YOU get old. For a quaint look, a cute little cabinet that DH crafted years ago was added to the corner - with a few interesting reads just within reach. I hung a picture from (aff link) Hobby Lobby that I bought when it was 50% off for $12.50 that lists the names of God, and a little wall clock from (aff link) Kohls that I bought with my $10 off a $10 purchase coupon. I found a really nice mirror for above the sink at an estate sale for $5.00. Alongside the cabinet is a candle stand that I bought years ago for just $3.00 from (aff link) Hobby Lobby during their home decor clearance just after Christmas. The candle was a clearance purchase as well. The silk plant on top of the cabinet was a $3.00 purchase from a garage sale many years ago. 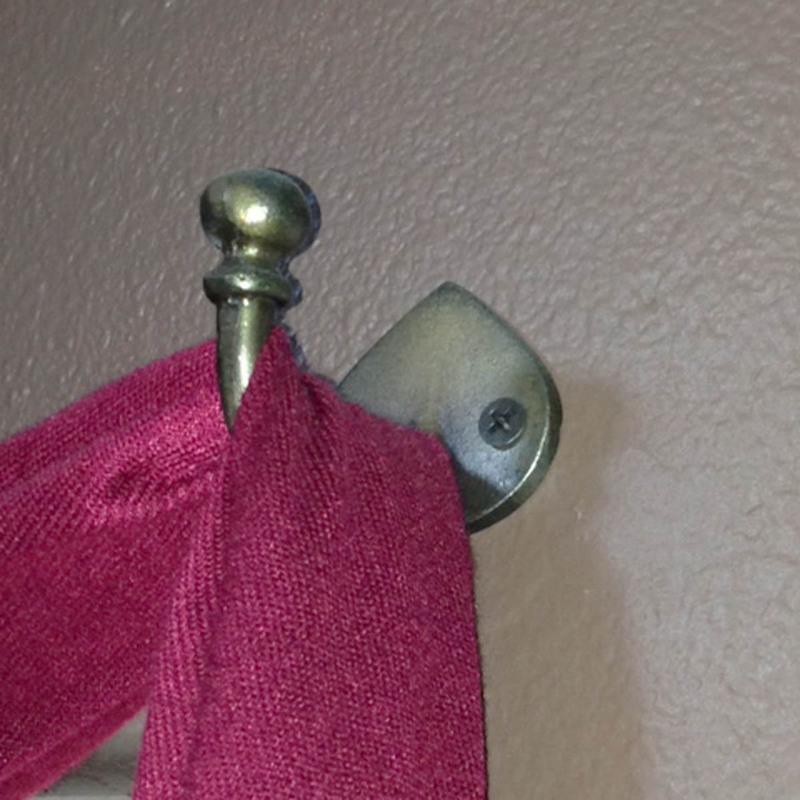 A window scarf draped over hooks added a simple dressing. After looking everywhere for something I liked and could afford, I came up dry. Most of the window scarves I found were either very cheap looking or too expensive. While doing my usual (aff link) Kohls hunting trip, I came up with the idea to use an actual ladies scarf for the window. The scarf was on sale for $11.99 and I used a 30% off coupon. 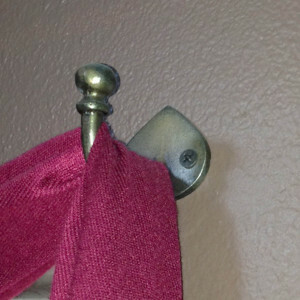 I bought hooks from (aff link) Hobby Lobby at 50% off for just a couple of dollars each. I was so anxious to get the scarf hung that I put the hooks up myself rather than wait for my handy man hubby to get home. Like I said before...I like to get my projects done right away. I'm just impatient like that. I am willing to search and wait to find a deal, but once I find it, I don't have the patience to wait to use it! Here is the hook close-up. The expression, "The devil is in the details," proves to be applicable in making a room stand out, especially if the details are unusual or you have used something that is repurposed. Challenge: Take something that was made for one purpose and use it for something totally different. In my office I used a shower rack and door knob on the wall for decoration and storage. That story will come later after I get one of my shelves painted and hung. What have you re-purposed in a room? You did such a great job on the house!!!!!! Mary-Margaret, I wish you could come for coffee so I could show you in person! God has been so good to us! My friend, I am so excited to see that are sharing your God given talents with the world. You amaze me! Brown is an unexpected color in a bathroom and it made your bathroom stand out. How about the cabinet full of books! It made me smile. The books in the bathroom have brought many comments from my guests! From one DIY-er named Val to another, what a wonderful transformation. 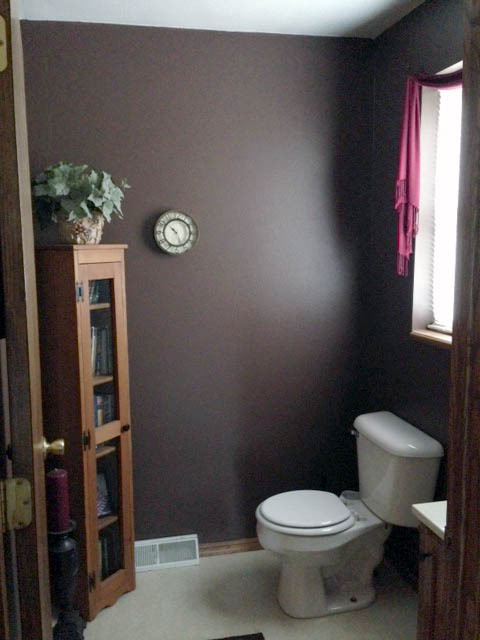 I would never think of using darker colors in a bathroom but yours turned out beautifully. The ambiance is serene and warm. I would hide out in there and read poetry!! Thanks Val! 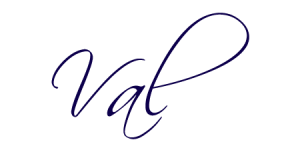 I’ve not met many Vals in my time. We do like the dark colors. I’m planning on painting the cabinet for a good contrast. We bought our home here in NW CT almost 3 years ago knowing it would take ALOT to make it our own. Built in 1900, it is a sort of post-Victorian/colonial, with good bones, great woodwork. Former owners did some attrocious updates, I think in the1970's, which disrespected this house's vintage charm and character. Most of what needed/needs to be done is cosmetic and my husband, Pete is very handy with a great design sense. And I'm not too shabby myself. Without a big budget, we have tackled several projects such as redoing the mud-room/laundry room, totally gutting and restoring the downstairs bath(which was mold infested…ewww. ), stripping lovely vintage wooden doors which were painted scary colors… We both work full time and so most of our work is done on evenings and weekends. My question to you is, "Does it seem to take forever to get your home the way you want it?". I'm a realist with a small budget and even though I love what we've done so far, I'm becoming impatient with our slow progress in almost 3 years. Thanks for any input! It sounds like I’m writing to myself especially with our names in common. 🙂 I have experienced the waiting to get the house the way I want it too. It does seem to take forever! But part of the fun is watching for deals, working out details and saving for just the right thing. Look at it as a journey rather than a destination. You are making memories and you will treasure every inch of improvement because you put yourself into each detail. It’s very satisfying to stand back and say, “I did that!” We have a small budget too. You should take a look at my Keeping Up With the Joneses posts. They had a molded basement that they are in the process of redoing. Mice were piled up behind the paneling! It was so gross. But once it was cleaned out we saw such potential. I’d love to see your before and afters. Did you take pictures? I love to see how others make over a room and do it inexpensively! Thanks for linking up with the Bloggers Brags Pinterest Party. I have pinned your post to the Bloggers Brags Pinterest Board! Oh that turned out really nice! Thanks Adelina, just like your blog, we have to turn our house into a home! Thanks, Marty. Dark, subtle colors are my mantra these days.